Debutant Jeffrey Schlupp scored twice to help Brentford to victory over Carlisle in a dress rehearsal of the Johnstone's Paint Trophy final. Carlisle had the better of the first half, with Craig Curran and Ben Marshall both being denied. Schlupp gave the hosts the lead in the second period from 12 yards out and got the second from close range after a goalmouth scramble. A Lubomir Michalik free-kick served merely as a consolation for Carlisle. 90:00+5:15 The referee ends the match. 90:00+2:55 Unfair challenge on Toumani Diagouraga by Francois Zoko results in a free kick. Indirect free kick taken by Marcus Bean. 90:00+0:48 Jeffery Schlupp challenges Tom Taiwo unfairly and gives away a free kick. Paul Thirlwell takes the direct free kick. 90:00+0:48 Substitution (Carlisle) makes a substitution, with Danny Livesey coming on for Matthew Robson. 88:52 Gary Alexander is ruled offside. Peter Murphy restarts play with the free kick. 87:10 Free kick awarded for an unfair challenge on Rory Loy by Leon Legge. 87:10 GOAL - Lubomir Michalik:Brentford 2 - 1 Carlisle Goal scored by Lubomir Michalik from the edge of the area to the bottom right corner of the goal. Brentford 2-1 Carlisle. 85:49 Booking Leon Legge goes into the referee's book for unsporting behaviour. 82:25 GOAL - Jeffery Schlupp:Brentford 2 - 0 Carlisle Jeffery Schlupp finds the net with a goal from deep inside the penalty box to the bottom left corner of the goal. Brentford 2-0 Carlisle. 80:57 Effort from the edge of the area by Toumani Diagouraga goes wide of the right-hand post. 79:59 Substitution James Berrett goes off and Francois Zoko comes on. 79:59 Substitution Rory Loy joins the action as a substitute, replacing Craig Curran. 75:03 Corner taken left-footed by Sam Wood, Adam Collin makes a clearance. 73:26 Assist on the goal came from Gary Alexander. 73:26 GOAL - Jeffery Schlupp:Brentford 1 - 0 Carlisle Jeffery Schlupp scores a goal from inside the penalty area to the bottom right corner of the goal. 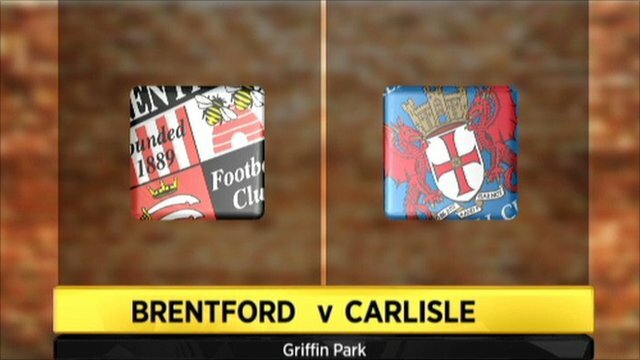 Brentford 1-0 Carlisle. 72:45 Strike by Craig Curran from inside the six-yard box clear the bar. 72:45 Substitution (Brentford) makes a substitution, with Sam Wood coming on for Myles Weston. 70:08 Outswinging corner taken right-footed by James Berrett played to the near post, clearance made by Kevin O'Connor. 65:55 Tom Taiwo takes a shot. Clearance by Pim Balkestein. Outswinging corner taken right-footed by Tom Taiwo from the right by-line, Leon Legge manages to make a clearance. 64:40 Outswinging corner taken right-footed by Paul Thirlwell from the left by-line, Toumani Diagouraga makes a clearance. 63:12 Substitution Kevin O'Connor is brought on as a substitute for Robbie Neilson. 60:10 Substitution Nathan Byrne joins the action as a substitute, replacing Adam Reed. 58:44 Myles Weston takes the outswinging corner, Close range header by Pim Balkestein goes over the bar. 56:56 Adam Reed takes a shot. Save by Adam Collin. 55:15 James Berrett takes a shot. Pim Balkestein gets a block in. Corner taken by James Berrett played to the near post, clearance made by Robbie Neilson. 54:07 Effort from deep inside the area by Harry Arter misses to the right of the target. 51:01 Corner taken right-footed by Myles Weston from the left by-line to the near post, Adam Collin makes a clearance. 47:09 Free kick awarded for a foul by Robbie Neilson on Harry Arter. Adam Collin takes the free kick. 45:00+1:06 It is the end of the first-half. 44:24 Myles Weston is ruled offside. Indirect free kick taken by Adam Collin. 38:14 Free kick awarded for a foul by Gary Alexander on Peter Murphy. Direct free kick taken by Adam Collin. 38:14 Booking Harry Arter booked for dissent. 36:32 Harry Arter challenges Myles Weston unfairly and gives away a free kick. Simon Moore takes the free kick. 28:09 Free kick awarded for a foul by James Berrett on Marcus Bean. Simon Moore takes the direct free kick. 26:25 Headed effort from inside the box by Jeffery Schlupp misses to the right of the target. Correction - 24:29 Gary Alexander takes a shot. Clearance made by Paul Thirlwell. Outswinging corner taken left-footed by Myles Weston from the left by-line, Marcus Bean takes a shot. Clearance by Peter Murphy. 24:29 Gary Alexander takes a shot. Paul Thirlwell manages to make a clearance. Myles Weston takes the outswinging corner, Marcus Bean takes a shot. Peter Murphy makes a clearance. 21:49 Craig Curran takes a shot. Craig Woodman manages to make a clearance. 16:34 The official flags Gary Alexander offside. Indirect free kick taken by Adam Collin. 16:04 Frank Simek gives away a free kick for an unfair challenge on Jeffery Schlupp. Free kick taken by Myles Weston. 14:56 Marcus Bean gives away a free kick for an unfair challenge on Tom Taiwo. Adam Collin takes the indirect free kick. 14:03 Short corner worked by Myles Weston. 12:38 Free kick awarded for an unfair challenge on Gary Alexander by Peter Murphy. Free kick crossed by Myles Weston. 8:20 Toumani Diagouraga concedes a free kick for a foul on Harry Arter. Adam Collin takes the free kick. 3:38 Corner taken right-footed by Myles Weston, Pim Balkestein has a header from deep inside the six-yard box and clears the crossbar. 1:11 Jeffery Schlupp takes a shot. Save by Adam Collin.